This is the last in a series of posts about masks from the Huasteca area of Mexico, and more specifically masks from parts of the Huasteca within the Mexican states of Hidalgo and Veracruz. Today we will look at Macho Cabrillo (“billy goat”) masks from Hidalgo. For many years I knew about these masks, but only recently did I learn that they could be worn by flyers (Voladores), the dancers who sail down from the top of a tall wooden pole on gradually unwinding and lengthening ropes. Unfortunately, I have been unable to find any further documentation or video to expand our knowledge on this aspect. 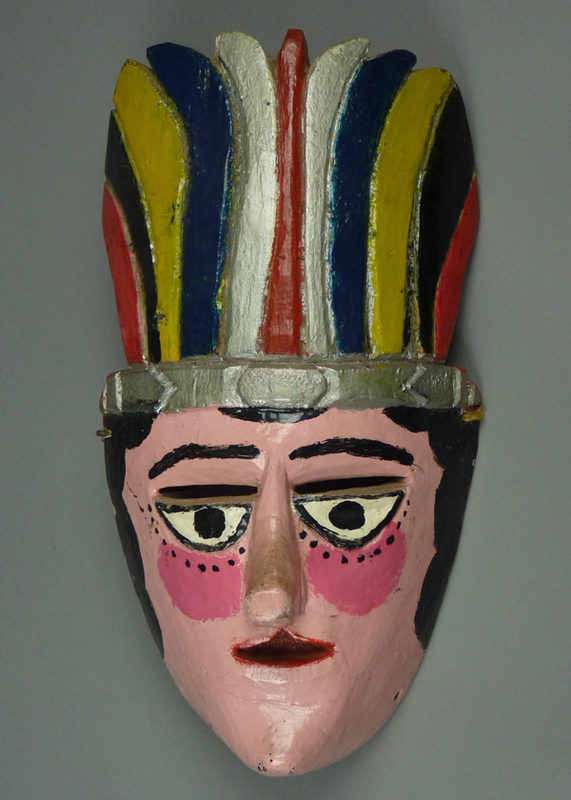 Here is a Macho Cabrillo mask from San Bartolo Tutotepec, Hidalgo, an Otomí village. I bought this mask from Jaled Muyaes and Estela Ogazon in 1998. These masks are interesting due to two distinctive features—they have twisted noses and their mouths are contorted in extreme grins. They usually have attached beards made from animal hair (probably goat hair) and of course they have goat horns attached with heavy nails. Colored ribbons dangle from a wire that stretches between the tips of the horns. As you may recall, in recent weeks I have rooted out a number of attractive masks from the part of the Huasteca that lies in the Mexican states of Hidalgo and Vercruz. These masks are certainly interesting for themselves, but more interesting in clusters of similar or related styles or dances. So I have been grouping them as I can. Today’s assortment is admittedly a somewhat heterogeneous group. The first of these is a mask that depicts a Pajaro Real (a peacock). In my June 6 post I had included a related mask, a Pito Real (Green Woodpecker) from Carpinteros. Today’s mask, which is probably not from Carpinteros, looks quite different from that one. In Mascaras, the book by Estela Ogazon (with the assistance of Jaled Muyaes, behind the scenes) that accompanied a mask show at the Universidad Nacional Autonoma de Mexico (UNAM) in 1981, mask #13 is another Pajaro Real mask, but that one has a leather face with an applied wooden nose. Unfortunately that book says nothing about the dance. If you compare the two examples, what they have in common is a dramatically phallic nose. Here is the one from my collection, which was found in “the Huasteca.” I got it from Robin and Barbara Cleaver in 1988, but I know that it was originally collected by Jaled and Estela. The nose is nailed to the wooden face of the mask. This is difficult to see, but the relief carved edges of the sideburns swing over the eyes to the edges of the nose (or bill), while the hairline continues as a painted feature. The chin has an ambiguous color because the paint there is layered—translucent black over the turquoise. The mask in the Mascaras book is of natural leather and with an unpainted wooden nose. Each of these masks has a similar mustache, but the leather mask doesn’t appear to have a beard. 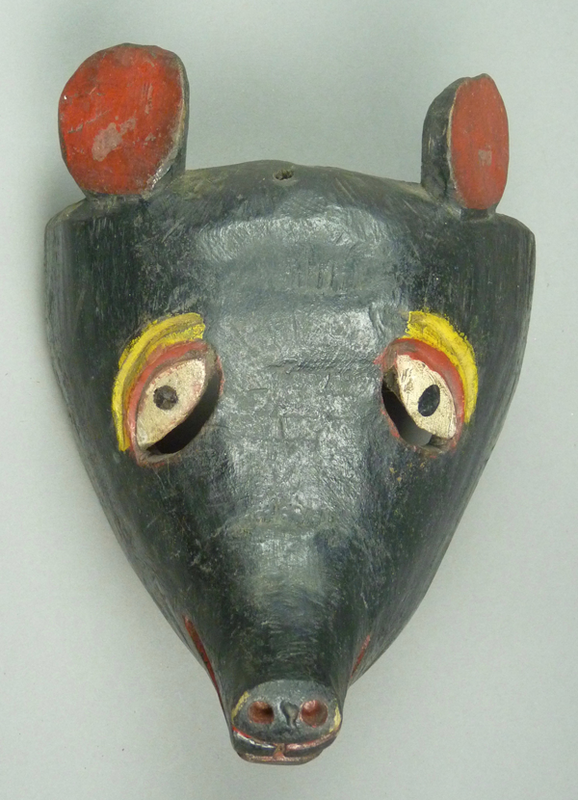 Last week I discussed a set of five masks from the area of Carpinteros, Veracruz—three birds, a rat, and a tejon (badger), illustrating two contrasting eye and vision slit styles that were very typical of that area in the mid to late 20th century. Today I will continue this discussion with five more masks from the same area: a Zorrillo (little fox), two Perros (dogs), a Torito (bull), and a Venadito (little deer). I bought the bull and one of the dogs from Robin and Barbara Cleaver in 1994, and the other three from Rene Bustamante in 1993 and 1994. I will start with the little fox. In this example the crescent shaped vision slits lie below the carved and painted eyes. It has a fox’s sharp little nose. This is another mask carved by Manuel Cortez. In last week’s post and in the next two that follow, I will focus on an area of Northern Veracruz centering on two neighboring towns— Huayacocotla Veracruz and Carpinteros Veracruz. Huayacotola lies just inside the Border between the Mexican states of Hidalgo and Veracruz, on the Veracruz side, while Carpinteros literally straddles the border; these communities are connected by a small paved road. They are so close together that I mention both, although the tags all focus on Carpinteros and its related community of Miahualco. If one consults modern satellite maps, the official location of Carpinteros is within the state of Hidalgo, although there is a small unnamed community directly adjacent, on the Veracruz side. In the face of this evidence, it is a fact that Jaled Muyaes, Rene Bustamante, and Dinah Gaston describe it as a place in Veracruz. Dinah even spoke of being in Hidalgo and looking across the border at the lights of Carpinteros on the Veracruz side. So I have followed convention and called it Carpinteros, Veracruz. The state line is actually irrelevant; the important geographic detail is that both towns are in an important culture area called the Huasteca. Today I will present five masks with the faces of animals or birds that are said to be from either Carpinteros Veracuz or from a nearby town, Miahualco Veracruz; the latter does not even show up on a satellite map. But first I will begin with a riddle that relates to the masks in last week’s post. I bought this mask of Malinche, used in the Danza de los Arquereos (Archers, a variant of the Conquest dance), from Rene Bustamante in 1993. Rene described it as from either Zurita, Veracruz or perhaps it was a rare mask from the Mexican state of Tamaulipas (Zurita is yet another place that is not to be found on available maps). Over the years I found the Tamaulipas theory appealing, but gave this little thought. Today I invite you to compare this mask to last week’s crop, in order to build a case for or against either of the two possible places of origin. This mask is 11 inches tall, 5¾ inches wide, and 3 inches deep. I will show the photos without any further remarks, and then at the end of this post I will comment.